Full glove-leather lining delivers buttery soft feel and eliminates pressure points. Custom Vibram soles put a spring in your stride and provide all day support. Lightweight Kevlar shank provides sturdy arch support. 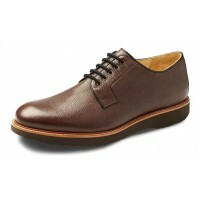 Triple-Density memory foam insole, topped in silky smooth leather. Easily removed if you wish to use your own orthotics or need to replace. Easily resoled for years of comfort. Handcrafted in Portugal.